There is enough Supreme Court aversion to go around, even to the state version of the highest court in the land. Sometime before Christmas, among the multitudes of greeting cards I received was the one you see here on the left. You probably have to click on each image to see them clearly. 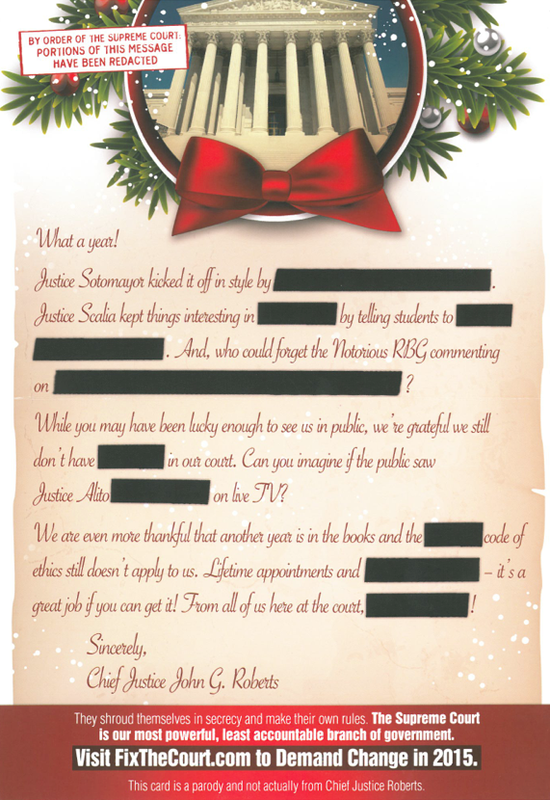 My favorite part is at the end of the inside part of the card. 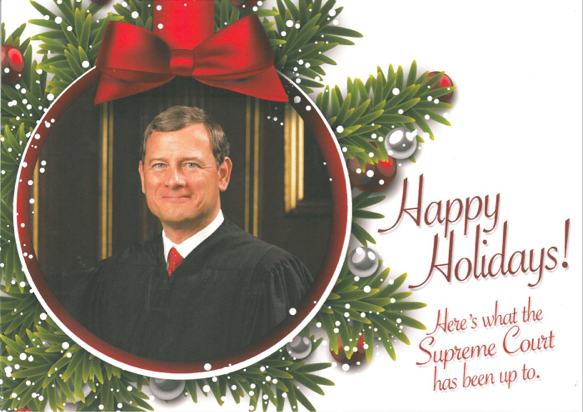 “This card is a parody and not actually from Chief Justice Roberts.” It’s a good thing that disclaimer is there, because Roberts could sue and eventually appeal the case all the way to himself. 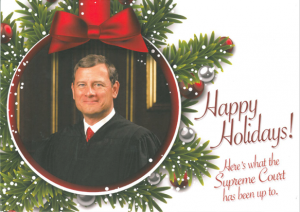 The message of this card is that the U.S. Supreme Court is secretive and accountable to no one. State lawmakers have a different complaint about the state nine, and they say partisanship is the answer. Why the dig? Because the state Supreme Court has not only ruled that the state is not meeting its paramount constitutional duty in adequately funding education, the court has a bucket of solutions it can choose from should the Legislature’s response to that ruling be deemed inadequate. Two local legislators, Democrat Sherry Appleton of Poulsbo and Republican Jesse Young of Gig Harbor, are among the co-sponsors. Among the solutions the court has discussed should the Legislature fail to meet the court’s definition of “adequate” education funding is one that would void the budget completely, undoing all tax loopholes. It seems unlikely the court would resort to that option first, but should it employ anything there are legislators who believe it would be out of its bounds. Hugh Spitzer, a constitutional law professor at the University of Washington, said any constitutional revenge by the Legislature would require near unanimity of the lawmaking body, which doesn’t seem likely. More within reach is legislators stalling state law fixes requested by the courts. Legislators have threatened the court financially in the past, but that seems unlikely, too. Punishing the courts financially “punishes the public if the public doesn’t have access to the courts,” Spitzer said. Furthermore, in a pinch the Supreme court could order funding from the state. It never has, but it could. Washington would not be the only state with partisan judges and it wouldn’t be the first time the state had such a setup. According to Judgepedia, seven states elect Supreme Court justices in partisan elections. In two states the justices are nominated in party primaries or conventions and other states involve the parties in lower court assignments. Spitzer said Washington judges were elected in partisan elections until 1907. Partisanship came back came back a few years later when Republicans were upset that a Democrat had been elected in a non-partisan election. GOP legislators managed to put two more seats on the bench, got two of their own elected and then made the judge races non-partisan again. Maybe this Legislature ought to consider doing that. If they did it during presidential election years, when all our televisions are affixed to Fox News and MSNBC, we might not notice. The newspapers would cover it, but who reads those anymore?